The Lion Dance (Wu Shi) is an ancient dance-ritual that plays an important role in all Chinese festivities. The dance dates back to the Han Dynasty (205 BC – 220 AD) and reached its apex during the Tang Dynasty (716-907); in this period the dance was primarily performed during religious festivities. The Lion Dance has also spilled over to Korea and Taiwan; though the dances differ somewhat in terms of performance, the underlying symbolism is much the same. The most famous festivity involving the Lion Dance is Chinese New Year, but the lion performs during weddings, to celebrate the spring-, harvest- and lunar festivals and constitutes an indispensable requirement for future good fortune during opening ceremonies. As such, Chinese proprietors of shops and restaurants outside of China will always do their utmost to ensure the performance of a Lion Dance when they open their businesses. Nevertheless, the lion is not only present during joyous occasions; he also dances during funeral ceremonies to underscore the grieving process of friends and families of the deceased. The lion can fulfill this important role because the Chinese consider it a sacred beast. The lion symbolizes courage, wisdom and power, and is seen as ruler of the land in the same way in which a dragon rules the skies. The lion is peace loving, helps people and brings them blessings, luck and joy of life. Though lions are not native to China, they found their way into the country on account of the famous Silk Route: rulers of the territories that today lie in Iran and Afghanistan sent lions to Chinese emperors as gifts for the purpose of acquiring the right to do business along the Silk Route. Many believe the Lion Dance is drawn from the legend of Foshan, but there is no historical certainty in the matter and alternative stories and explanations for the origins of the ritual abound. The Foshan legend tells of a village in the South of China that was relentlessly threatened by terrible monster. Each year, the monster brought about hunger and misery by destroying the villagers’ rice-fields night upon night. The people were afraid to stand up to the monster, until a woman came up with a cunning plan around New Year. The villagers fashioned a giant lion’s head out of bamboo, decorated it with brightly colored papier-mâché and fabric, and bravely set off to confront the monster. By making fierce movements and producing a great deal of noise and light, the villagers succeeded in driving out their evil tormentor and were able to live in safety and peace. A somewhat different story tells of a strange creature that appeared in China long ago, scaring both man and animal. The swift, wild creature was called ‘nien’ or ‘nian’; a word that is reminiscent of the Chinese word for ‘year’. Neither the fox nor the tiger could do anything to stop the nien, so the desperate people turned to the lion for help. The lion shook his manes, charged the creature and wounded it. Fleeing with its tail between its legs, the nien vowed to avenge itself on the lion. Indeed, the following year the nien turned up again. This time the lion could not help because he was too busy guarding the gates of the imperial palace. Deciding they needed to act themselves, the villagers fashioned a likeness of the lion out of bamboo and papier-mâché. Two men climbed inside, approached the nien and reared up, roaring like a lion. The ploy worked and the nien fled a second time. 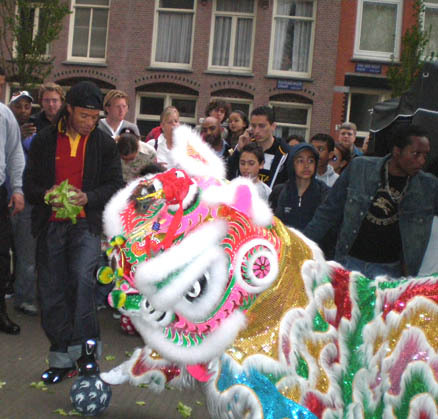 Geographically, the Chinese Lion Dance knows two traditions: there is a Northern and Southern Chinese style. The Southern style is best known in the West. The Northern and Southern lions differ both in terms of appearance and movements. Whereas Northern lion bears a closer outward resemblance to a real lion, the movements of the Southern lion are more realistic. It is striking that the members of Lion Dance-groups in the South are usually members of a Kung Fu school: the steps to the dance are unmistakably linked to Kung Fu movements. 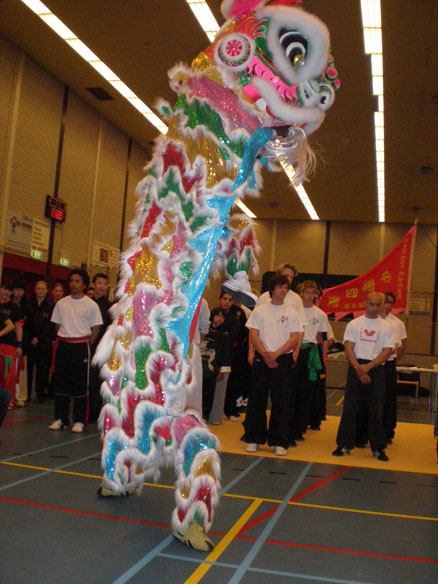 The Liu He Men Kung Fu School practices the Southern – or Fut Chan – style of Lion Dancing. 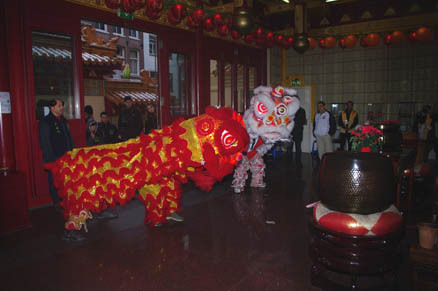 The lion is played by two dancers: the front dancer takes the lead and bears the lion’s head which is fashioned out of strong but light materials such as bamboo and brightly colored papier-mâché. It is crucial that this front dancer is strong and indefatigable because – in spite of the lightweight materials – the head is heavy. What is more, as well as moving the head itself, this dancer has to work the mechanisms inside the head: he has to flicker the eyelids, open the mouth and move the ears in order to express the lion’s mood. From under a cloth attached to the lion’s head, the second dancer acts as the body and tail of the lion. This dancer cannot see much from under the cloth and has to focus on the first dancer in order to follow the lion’s steps and jumps as best he can, thus ensuring that the lion moves as a single unit. Aside from the lion, an additional figure is often involved in the Lion Dance: namely a little Buddha with a hand-held facial mask. This character tempts the lion with a fan or a giant ball. 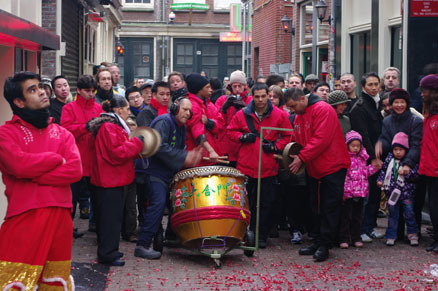 The history of the music that accompanies the Lion Dance also dates back ages. The “Tai Pin” melody was composed during the Chow Dynasty (700 BC) and consists of the sound of a giant drum complemented by gongs and cymbals. There are always at least three musicians performing during a Lion Dance. The chief function of the music is to convey the lion’s mood; as such the music always follows the lion in its movements. It is important that the lion dances to the correct rhythm because each type of movement has a rhythm of its own. The drum follows the lion and the gong and cymbals follow the drum. 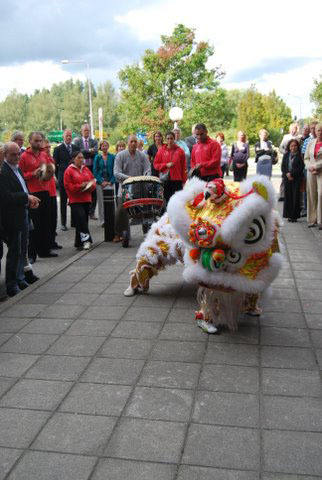 Our school has a lion dancing team who's history is also long and colourful. We have danced for many from Job Cohen and Ahmed Aboutaleb to the Queen. If you are looking for a lion dance for your special occasion be it an opening or a party of any kind don't hesitate to contact us for the possibilities.